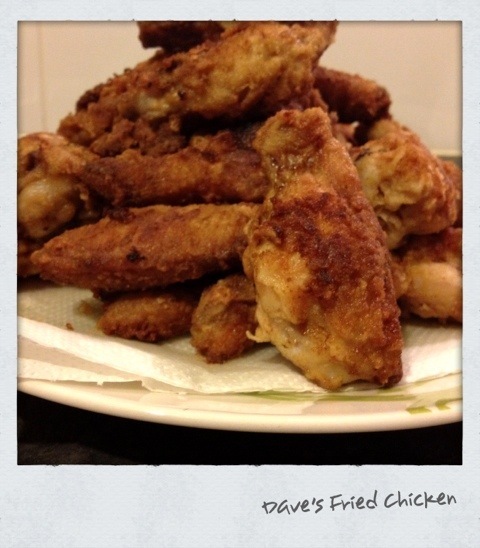 There aren’t many that know fried chicken like a southern boy, and Dave surely knows how to make fried chicken. In our 7 years of marriage he has cooked this gor-met delicacy for me only twice. Once on New Years three years ago and tonight, surprisingly, he fried up a big lovely mess of chicken. Unprompted! Because I’m sure you wish to dine on only the best fried chicken nibbles, Dave agreed to share his very complicated recipe below. Bon appetit! Marinate chicken wings / nibbles in butter, garlic, salt and pepps, Worcestershire sauce, soy sauce and two eggs. Fry in hot hot oil i.e canola in a shallow pan until golden and crispy and you have cooked all the salmonella out.